Its primary function is the ability to operate on virtually any lock and thus open doors, either for escape or for exploration. It has also been used as for repairing equipment, as an offensive weapon, and occasionally even used to drive screws. 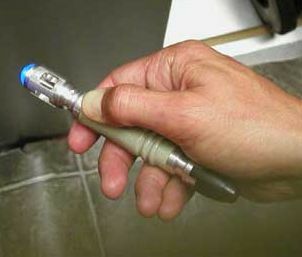 As fate would have it all Starship repair kits come with two useful tools, a Hydrospanner and a Sonic Screwdriver. How it came about is anyone's guess although a smart person might put two and two together and figure that a certain wandering Timelord might've dropped his sonic screwdriver somewhere in the distant past. That Sonic screwdriver might've been the basis for every other Sonic screwdriver that came afterwards and thus he might've inadvertently created a paradox from which even he couldn't escape. On the other hand it might just be some odd twist of fate that Starship repair kits also come with a tool named the Sonic Screwdriver and that the Timelords just happen to have a similarly named tool . Either way...The Doctor came to collect his from Drex Marr and Kae' Caballa while they were resting in Central Park on Earth. Neither he nor the Sonic Screwdriver were ever seen again.